It was amazing. Seriously amazing. And I could eat enough to be full. And it was delicious. In fact, if I hadn't known it was cauliflower, I would have thought it was a gourmet cream of wheat of some kind. This is a super tricky, evil and wonderful way to transform a head of cauliflower into something the whole family will enjoy. I defrosted my bag of cauliflower overnight, and then microwaved half a bag at a time for 2 minutes to finish it off. I then drained and squeezed it . 16 oz. makes 2 packed and heaped cups. Add half to your blender with 1/4 a cup coconut milk and blend on minced. Add another 1/4 and scrape down sides in between, until you get a thick cream of wheat consistency. Empty into your saucepan, and repeat with other half. Add spice, honey, and 2 tsp. maple. The remaining teaspoons are to drizzle over the finished product. Stirring frequently, cook about 5-8 minutes, until soft, heated through, and flavorful. Be careful not to overcook-remember, it was zapped once already! Serve with one tsp maple drizzled over top. Here you see I also chopped up a few medjool dates (not included in the nutritional info or calorie info-dates are high calorie beasties, but delish). Serves 3 at 98 calories a serving. Microwave frozen cauliflower for 2 minutes. 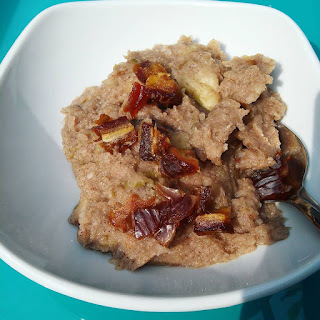 Combine in blender with coconut milk on mince until cream of wheat consistency, scraping down sides twice. Scrape out into small soup pan and heat through, until super creamy. The great thing about this is that there's so much you can do to add flavor. Add compotes, jellies, and other fruits to make your own delicious variations.